St Paul's Lodge01904 611514work01904623188fax Guest HouseA warm welcome awaits you at this Grade 2 listed building dating from 1839 and backing onto York's only remaining Victorian Square. Set in a Residential area yet only a 15 minute walk into the City Centre we are a Small friendly family run guest house catering for all your needs in order to ensure a comfortable stay in our historical city. All rooms have complimentary toiletries, hospitality tray, hairdryer, iron & ironing board. Offering A hearty Full English Breakfast with special diet requests or Semi Self Cater option in some rooms. We have a large free secure car park at the rear. (Entrance in Watson Terrace). Guests have access to wireless Internet in all rooms free of charge. Regular public transport right outside the front entrance (only a 10 min walk from the railway station) close to the Racecourse and all the attractions of York. We are situated on the A59 Harrogate to York Road and only a 54 min drive from Leeds Bradford Airport. There are many restaurants and pubs all within walking distance of our guest house and the nearest two both serve Real Ales and have a charming relaxed atmosphere. A warm welcome awaits you at this Grade 2 listed building dating from 1839 and backing onto York's only remaining Victorian Square. Set in a Residential area yet only a 15 minute walk into the City Centre we are a Small friendly family run guest house catering for all your needs in order to ensure a comfortable stay in our historical city. 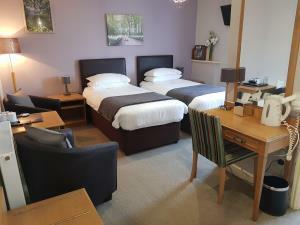 All rooms have complimentary toiletries, hospitality tray, hairdryer, iron & ironing board. Offering A hearty Full English Breakfast with special diet requests or Semi Self Cater option in some rooms. We have a large free secure car park at the rear. (Entrance in Watson Terrace). Guests have access to wireless Internet in all rooms free of charge. Regular public transport right outside the front entrance (only a 10 min walk from the railway station) close to the Racecourse and all the attractions of York. We are situated on the A59 Harrogate to York Road and only a 54 min drive from Leeds Bradford Airport. Offering A hearty Full English Breakfast with special diet requests or Semi Self Cater option in some rooms. Children welcome from any age. St Paul's Lodge sometimes limits bookings to 2 or more days. ROOM ONLY. Self Catering facilities for breakfast prep. 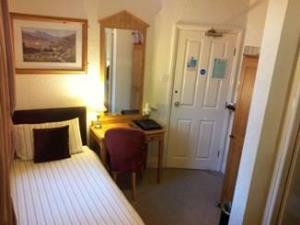 Double en-suite room, King-size bed, single child's bed Pull out bed for 3rd person, bath and shower. Fridge/Freezer, Microwave, Toaster, Kettle. Flat screen TV/DVD,Iron,Hairdryer,Toiletries. Double or Twin bed room (on request) with seating area, has a bath, and shower.flat screen TV/DVD. Trouser press,Iron,Hairdryer,Toiletries,tea making. The room which is on the 2nd floor at the rear has views across the city towards the minster and Rail Station. By Road:On the Holgate Road (A59) and on a bus route. Very comfortable and welcoming. Most varied and generous breakfast. Our landlady, Julie, provided all the local information and directions we required. It was a pleasure to host you ladies and I am pleased that you enjoyed your stay with me. parking may be available at the front entrance. This is a historical Listed building that can not be adapted for wheelchair users and there are no ground floor bedrooms.